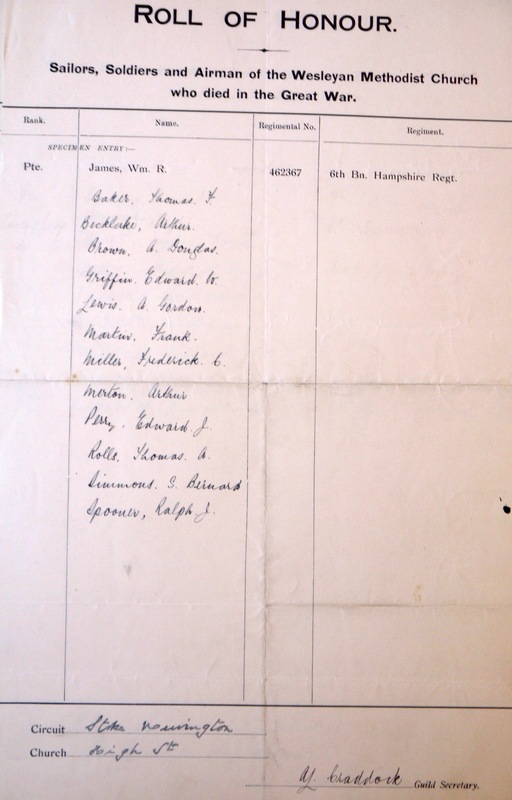 Twelve names are recorded on this document. The church was replaced in 2016 and no war memorial is recorded. It apears that none of these men appear on the Stoke Newington war memorial, so this is the only record that they were Wesleyans who died. The Wesleyan Methodist Historic Roll records that the families of Edward Griffin and Frederick Miller contributed, as did Arthur Becklake himself, confirming their attachment to this church. The original Roll contains names only. Additional details are given in the following transcription if there is reliable evidence.